We specialize in offering a comprehensive range of 2 in 1 Gravity Die Casting Machine. Our range works on the principle of single power pack, double production, which ensures high productivity at low investment. 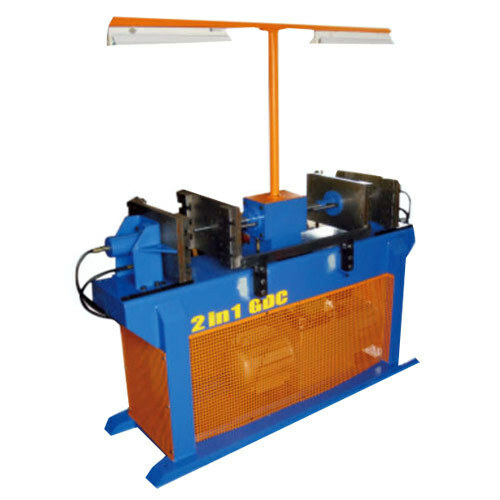 These machines occupy less space, and make optimum use of manpower and machine power while consuming less power. We also undertake erection and commissioning of imported foundry machines. Backed by more than two decades of industrial experience, we are involved in offering a finest quality range of Foundry Machines. Our range comprises Cold Box Core Shooter Machine, Cold Box Sand Preparation Unit, Tiltable Gravity Die Casting Machine, Universal Gravity Die Casting Machine, Low Pressure Die Casting Machine, 2 in 1 Gravity Die Casting Machine, Degassing Machine, Trimming Machine, Briquetting Machine, Indigenous No Bake System, Mold Handling Equipment, Vertical Gravity Die Casting Machine, Cold Box Core Shooter Machine in different Types and Tiltable Gravity Die Casting Machines. These products cater to the needs of various industries like Automobile, Electronics and Steel. Apart from this, we also provide Excellent Foundry & Industrial Automation Services to Hydro-Pneumatic PLC Special Purpose Machine. Our experts precisely undertake the commissioning of imported machines. Owing to our robust infrastructure, we have been able to customize our products according to the diverse requirements of our clients. With the assistance of our sophisticated machines, we are further able to reduce the production cost, and develop superior products. Moreover, our quality controllers rigorously test the products for various parameters like quality, durability, corrosion resistance and performance. Owing to our adherence to client centric approach and satisfactory products & services, we have gained a strong foothold across the globe.